Every American state loses or gains population because of the migration, and there is nothing surprising in moving to New Mexico as well. It is the state where one in every ten local residents is an immigrant and 70% of these people arrive in the state from Mexico. In addition to immigrants that constitute 10% of the state population, about 11% of residents would admit that one of their parents is a native American and another one is an immigrant. Such a huge flow of people made immigrants a powerful workforce. Most of them are employed in such industries as fishing, construction, farming, and other blue-collar positions. Despite a negative net migration between 2010 and 2017, the state has not lost a big number of population because of immigrants and residents who arrived from other states. New Mexico welcomed people from different states, but the biggest number of newcomers was from such states as Florida, Maryland, Indiana, Tennessee, and Ohio. New Mexico has experienced the 4th lowest increase in population between July 2017 and July 2018 – only 2,000 people arrived there. 2018 has also become the first year since 2012 with the lowest net-migration loss. It means that the state economy is strengthening and many people are ready to start their happy life in New Mexico and develop together with the state. Every state has a number of features that either attract people or discourage them from moving to it. New Mexico is not an exception. When you start thinking about moving to New Mexico, pros and cons of this decision can be found easily. Let’s analyze what makes this state appealing to movers first of all. New Mexico is a rather affordable state to live in. It is one of few states where the cost of living index is lower than the average national one. The overall index is 4% lower than the average one and the main factors in this are the cost of food and groceries as well as healthcare and transportation. 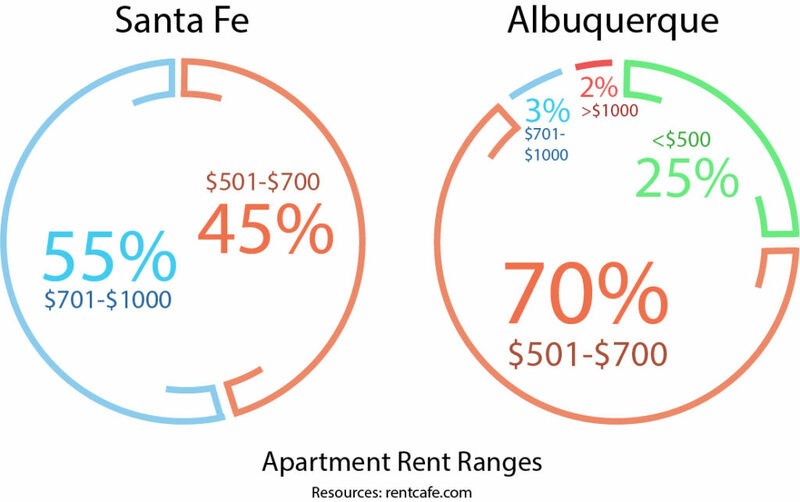 If to compare two biggest metro areas in the state Albuquerque and Santa Fe, it is possible to make a conclusion that consumer prices and local purchasing power there are almost equal. Moreover, with the average salary of about $2,600, local people can earn their living and enjoy their lives. One of the main factors that influence people’s desire to relocate is the cost of housing. New Mexico can boast ones of the lowest prices for homes as their median price is 5% cheaper than the national one – it is only $187,000. Rental prices in the state are also rather affordable. The most expensive city to live in New Mexico is Santa Fe. One-bedroom apartment in and outside the city center costs $1,166 and $903 respectively. 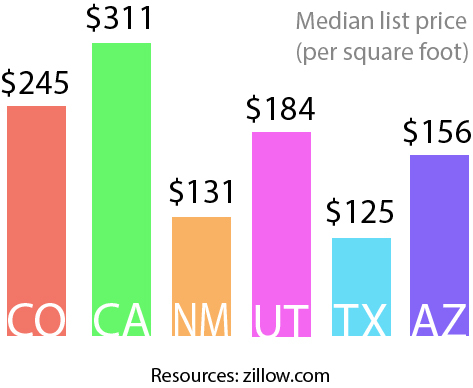 The rental prices in Albuquerque are even lower – $841 and $735. New Mexico is a state with a long history and a rather diverse ethnicity. In addition to native American tribes and residents, there is a variety of Latinos and Hispanic population. Moreover, there are big communities of African-American, Asian and Middle Eastern people. It has contributed to the development of a unique culture with many exclusive traditions. There is a special architecture style, exclusive arts including painting and pottery, dancing, and even food. The state can boast its own cuisine that has been greatly influenced by Mexican and Spanish one. Being called the Land of Enchantment, New Mexico does have a very various and beautiful landscape. You can start your journey along the desert and in a couple of hours appear in the mountains. Moreover, you can walk in the forests, rest on the bank of the rivers as well as enjoy the magnificence of such natural phenomenon as canyons and valleys. Most of the land in the state belongs to the community, so everyone can discover the trails and sights of this area. Moreover, the state can boast a very clean air – even metropolitan areas located here are considered to be the least polluted in the country. Another great feature characteristic of southern New Mexico is beautiful skies. It is a perfect destination to gaze at stars and constellations as they are incredibly distinct and bright here. The climate in New Mexico is mild and continental. Local residents can feel all four seasons: enjoy warm and sunny weather in summer and snowfalls in winter. The main feature of the local climate is dryness – there is an abundance of sunshine and very little precipitation throughout the year. It is one of the reasons why this state has such clean air and is an excellent choice to live in retirement. The area can boast one of the oldest vines that have been growing here since the 1960s. Local wine is incredibly tasty as it has been influenced by Spanish traditions. There is even a True Wine Trail in the state to be able to visit all the best wineries in one way. New Mexico is a state with the long history, and it is possible to find here many ties with native American tribes. Santa Fe is considered to be the oldest continually inhabited US city. Moreover, this area is believed to be the origin of American Cowboys. Another thing that makes this state outstanding is being the only one in the USA with so many UNESCO World Heritage Sites – three of them are located here. It is difficult to find another state that offers such a great variety of entertainment and activities. Both climate and landscape make this state a Mecca for people who enjoy resting outdoors. There are many opportunities to take up hiking, cycling, rafting, kayaking, skiing, climbing, horse riding etc. It is the place where all kinds of arts flourish – you can enjoy everything starting from painting and designing and finishing with opera and theatre. The state is a home to many different events and festivals, one of which attracts people from all the corners of the world – the annual balloon fiesta. Another reason to spend your retirement here is free access to the gambling industry as casinos are legal here. At the same time, moving to New Mexico can be connected with a number of some challenges or negative sides that must be considered before you make your final choice. Not everything is so good in this state, so think about the following drawbacks. Despite the fact that many different industries are well-developed in the state, it is not easy to find a well-paid job. The unemployment rate in New Mexico is about 7% that is higher than the average national one by almost 3%. Unfortunately, according to Wallet Hub, the state takes only the 43th place in the list of places with good career opportunities. This state is considered to have one of the most diverse ethnic groups in the USA. Only in Santa Fe, there are over 70 ethnicities living in the city. With the population of over 2 million people, only 51.4% of people were born in this state and 37.9% have come from other states. 47% of the local residents have Hispanic ancestry being descendants of colonists from Spain and residents of Latin America. However, 11.4% of the state population are Indian, 1.7% are Asian, and 1.4% are black. Only 28% are non-hispanic white ones. There are residents with 2 and more races as well as many people with other ethnicities. Though the state could be proud of the highest number of PhD holders in 2000, primary and secondary school education is considered to be low-quality here. The state has been even accused of violating the constitutional rights of students not providing them with sufficient education. In 2018, it was reported that only 25% of students in grades 3-11 managed to pass Maths test, and 31% of students completed a test in English arts successfully. New Mexico is in the list of the states with the poor condition of rural roads. It was reported that 25% of all rural roads in the state are in the condition that can increase traffic fatalities. Many bridges in the state are also in the worst state, while New Mexico is home to the most dangerous road in the USA called U.S. 666 or “the Devil’s Highway.” In addition, it is important to remind that there are many mountainous roads that are not safe for driving as well. Unfortunately, it is impossible to call New Mexico a safe place for living. The percentage of violent crimes per 1,000 residents is 7.83%, while the national one is only 4%. The number of property crimes is also bigger in comparison with the national one – 39.42% vs 24%. Moreover, it is legal in the state to use stun guns and tasers for self-defense – gun laws also do not make the state safer. Moving to NM has its own peculiarities. Unlike other states, there are several points you should consider especially if you move to this state. That is the reason why we have prepared several tips for Californians moving to New Mexico and people from other states. It is natural that New Mexico is a US state where English is the main language. But the proximity of the Mexico border and the abundance of Hispanic population may lead to misunderstandings. People got accustomed to using some Spanish words instead of the English ones as well as speak only in Spanish. If you want to become one of the local residents, learn some basics of this language. It is great if you own a car, but arriving in the new state it is very important to subject it to car registration. It does not cost much and no inspection is required. But if you have no car, you will probably need one because public transportation is well-developed only in Albuquerque. The combination of dry climate and hot summer days may be unbearable for people who have not got used to that. At first, you may lack air and feel exhausted by the sun, so if you choose July and August for moving, it can be a trial. If you have an option when to move, choose spring or autumn months when the temperature does not go extreme. As it was already mentioned, be prepared for the diversity of ethnic groups living on the territory of the state. You may see mixed race couples and their children as well as gay pairs. Try not to think stereotypically and leave them behind when you decide to relocate. It is natural that you are going to another state and there are things to know before moving to New Mexico. But in addition to the pros and cons of the destination state, you should make one more important decision – choose a city to head for. Most of the state settlements are small towns and villages, while there are only several big cities with metropolitan areas. 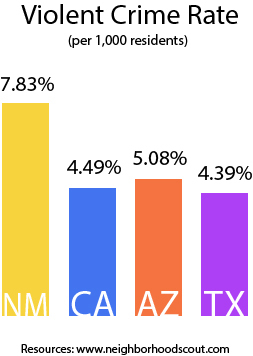 Here are the most popular destinations in New Mexico to choose from. Being one of the most popular cities in New Mexico, there city is not big and has a population of 83,875 in the whole metro area. It is the oldest state capital in the USA dating back to 1610. In addition, this city has been designated as Creative City by UNESCO due to its focus on folk art, crafts and design. Nowadays, the city has an association with science and technology as well as attracts thousands of tourists to see its sights. Being the most populated and the largest city in New Mexico, over half a million people reside in the place that is often called Duke City. It is a city that attracts many artistic and creative people, especially by numerous fairs held there. Here you can see the world’s second-longest passenger aerial tramway as well as the largest International Balloon Fiesta. Many high-tech companies are concentrated here, however, other biggest employees are scientific laboratories, air force base, and solar systems. This city is the third largest and the fastest expanding one in the state. Its population has almost reached 100 thousand people living on the territory of 103.7 square miles. Most of people are employed in technology here, as major employers are renowned Intel and HP companies. However, other spheres such as education and healthcare are also well-developed. The second largest city in NM Las Cruces is an economic, cultural, and agricultural center of the southern part of the state. Most people take governmental jobs here, but other major employers require specialists in education, healthcare, retail, and services. It is a city of festivals many venues worth visiting by everyone. Despite its rather small area and only 8 thousand people living here, this city is a famous resort that attracts thousands of people annually. Lying in the Sierra Blanca mountain range, it is a ski resort that is also the 4th fastest-growing city in the state. Many people arrive here as guests and decide to settle in it forever. When you plan moving by yourself, it is impossible to consider all the moving costs as there are many unpredictable situations you cannot be prepared for. It is not enough to buy a ticket on the plane, train, bus or pack a car with your belongings, there are dozens of other challenges to complete too. It is the reason why professional moving companies from California to New Mexico can be the most affordable and, at the same time, comfortable solution for relocation. California Movers offers a full list of services connected with relocation, so your moving experience can be pleasant and memorable with our assistance. Moreover, you can save on your cost of moving and head for your new home in an excellent mood. Every person who is thinking of moving to New Mexico should prepare for this responsible stage in life. It is the reason to look through the following resource guide for movers and Avoid possible pitfalls on your way to a new happy life.